“US media is filled with unproven allegations that Russia is working to defeat Hillary Clinton at the polls in November. Despite no solid evidence being provided, Clinton continues to allege that Russia is responsible for the leaking of DNC e-mails, and mainstream media echoes her allegation. What motive could possibly exist for this alleged crime? According to [Mrs.] Clinton it is about ideology. As Clinton put it in her recent speech: “The grand godfather of this global brand of extreme nationalism is Russian President Vladimir Putin.” Essentially, Clinton argues that Putin holds similar political views to Trump, and is trying to get him elected. The unproven allegations based on a rather loose perception of ideological similarities, forces students of American history to recall the Cold War rhetoric of the far- right. For example, Martin Luther King Jr. was frequently called a Soviet agent by the US right-wing simply because both Soviet Communists and the Civil Rights Activists believed in racial equality. In the early 1960s, a widely circulated documentary from Edward G. Griffin purported to “prove” a link between the Civil Rights Movement and the Cuban government because “Venceremos” and “We Shall Overcome” have a similar meaning. What was the secret to fixing Russia’s economy? Putin dropped many of the extreme free market policies that had been championed by Clinton and Yeltsin. Russia’s economy re-emerged primarily due to public control of oil and natural gas. The Russian economy is now centered around state controlled natural resources with a very high rate of public ownership. Putin’s “National Priorities Project” focused on building a social safety net for the population. The Russian government has also created “Nashi” summer camps, hoping to cultivate and train the best and brightest young Russians to work for the good of their nation. Despite being described as “left,” both Hillary Clinton and her husband are closely identified with neoliberalism and privatizations. Bill and Hillary Clinton’s political careers are closely associated with the Democratic Leadership Council, a non-profit organization that maneuvered within the Democratic Party to push for free market policies and undermine the remaining Social-Democratic and Rooseveltian factions that existed in the late 1980s. Bill Clinton signed the widely unpopular North American Free Trade Agreement (NAFTA). 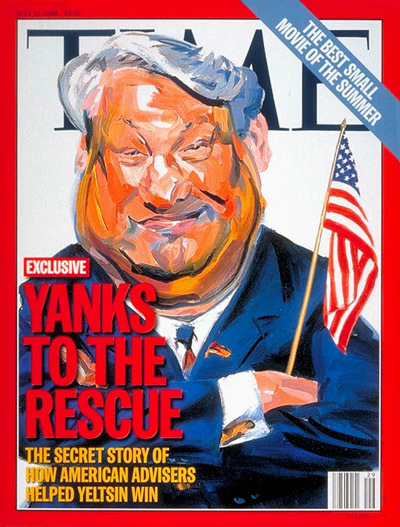 “One reason why Yeltsin was the West’s darling — while Mr. Putin is the target of virulent attacks — was that his policies perfectly suited the Western agenda for Russia, a superpower-turned economic and military weakling, a subservient client state and a source of cheap energy and minerals. By contrast, Russia’s resurgence under Mr. Putin is seen as upsetting the global balance of power and threatening the U.S. unipolar model….